In the beginning of 1930s, a lot of pioneers from main land crossed the sea to Hokkaido where the cultivation became prosperous afterwards. The pig farming was thriving in order to restore the energies of pioneers in Obihiro, Tokachi area in Hokkaido. In 1933, Obihiro traditional food Butadon was born in that land. Although it is a simple food that charcoal grilled thick pork put on white rice, the combination of sweet sauce, thick pork and white rice is perfect that you will never forget its taste once you eat it. 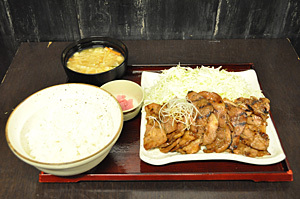 At Tontan, pork with mildly sweet sauce is grilled by charcoal fire carefully, put on white rice and covered with a lid in order to keep the flavour and the taste until it is reach your mouth. This is the only Butadon restaurant in Tokyo that preserves the traditional Obihiro taste and style. 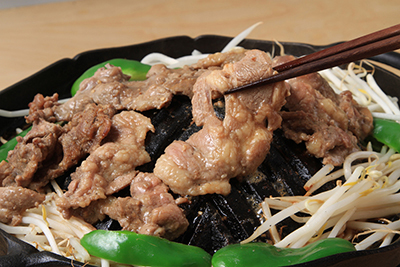 From 5 PM, you can also enjoy Obihiro Jingisukan (grilled mutton dish). 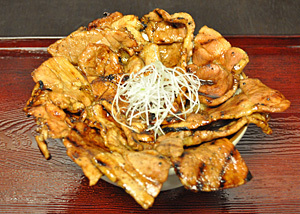 Obihiro Jingisukan is unique for its soft mutton even after grilled and without peculiar mutton taste. 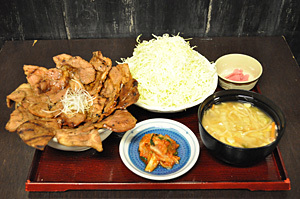 We provide Jingisukan by Jingisukan nabe so that the meat juice from mutton seeps into vegetables and it's perfectly fit either rice or beer! You can also enjoy our Obihiro wine. 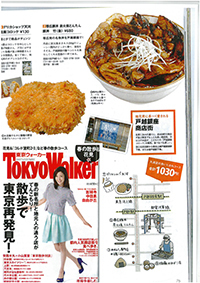 Please enjoy yourself at Tontan! It’s only Butadon, but still we like it! 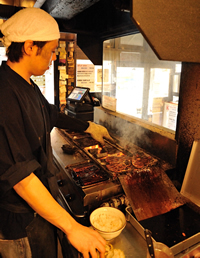 Our store manager protecting the ultra high temperature charcoal grill is well experienced chef who had trained at Chinese restaurant that is famous for its fire manipulation. 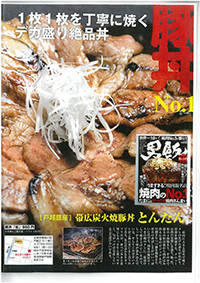 By grilling pork with secret sauce carefully which thought out to fit perfectly with rice, he provides us exquisite thickness pork which not only easy-to-eat but also filling to eat with perfect flavour of charcoal fire! Copyright (C)　帯広豚丼　炭火焼　とんたん All Rights Reserved.